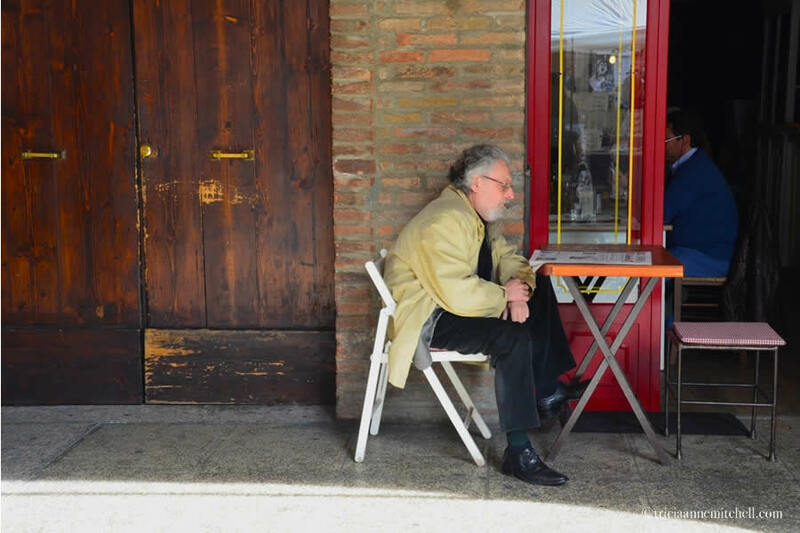 The mood on the streets of this northwestern Italian town was undeniably cheerful and seemingly perfect, at least on the surface. The streets were immaculate, and blooming forsythia bushes guarded the entryways to well-heeled shops. Bikers of all ages pedaled past us, some in classic business attire. Well-clad couples strolled, arm in arm. 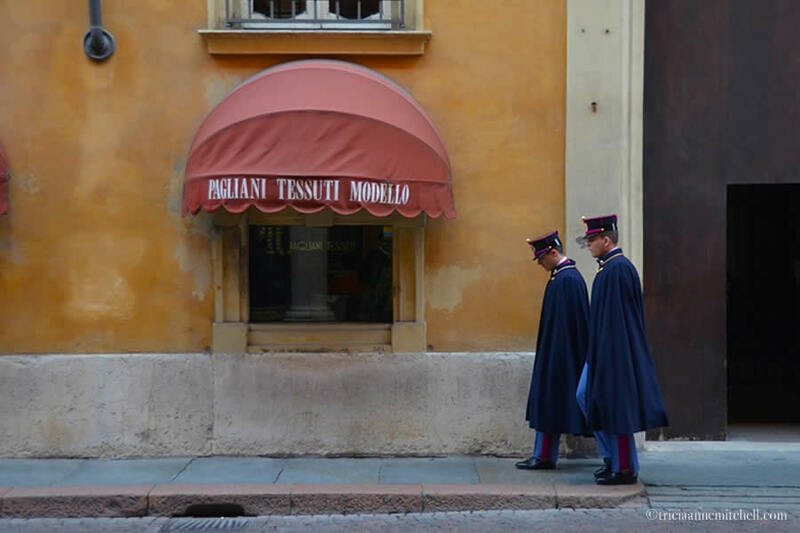 Military cadets from Italy’s prestigious academy walked the streets, wearing traditional uniforms, dressed in capes adorned with gold buttons. 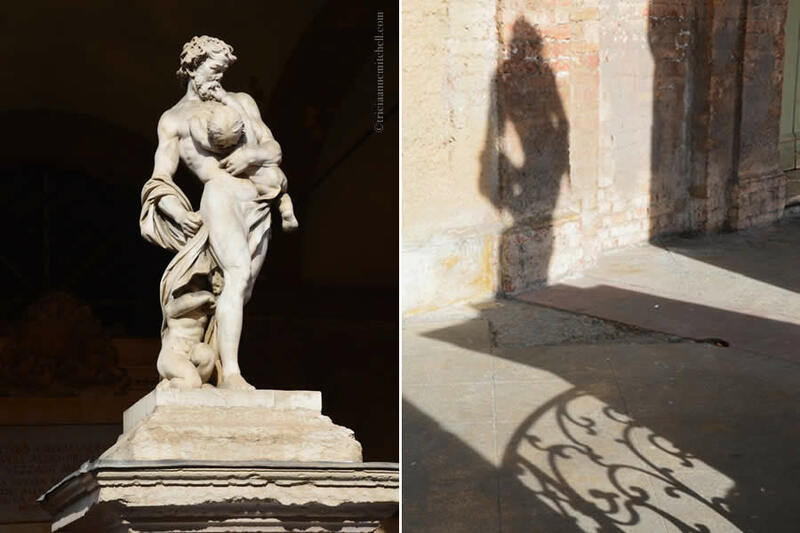 Children played on timeworn lions guarding Modena’s celebrated Romanesque cathedral, one of the city’s UNESCO World Heritage sites. 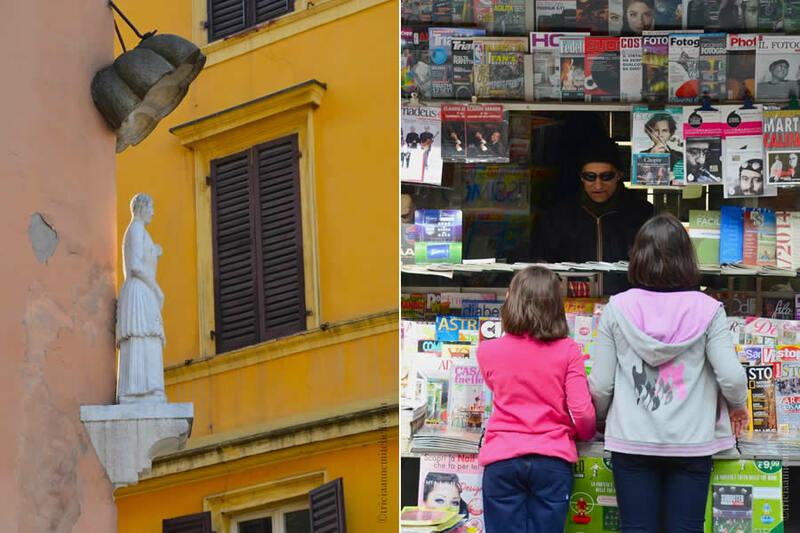 For three wonderful days, we simply soaked up the city’s must-see attractions, as well its serendipitous charms. 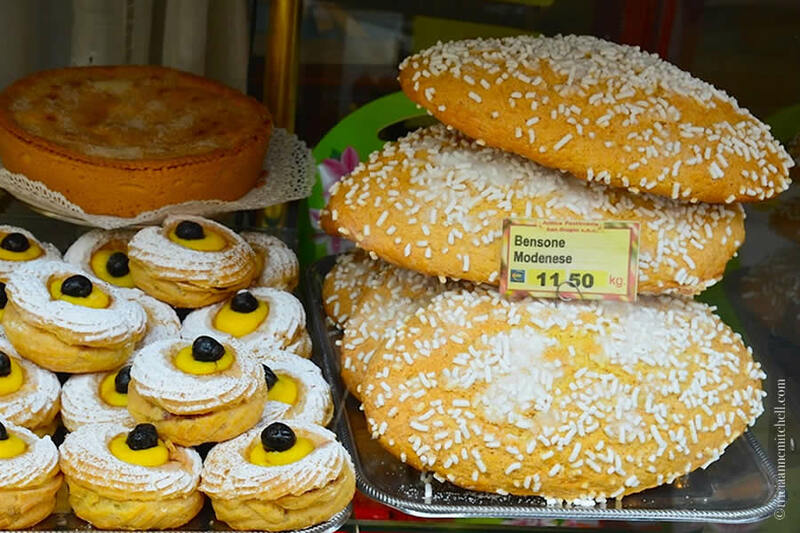 During our first full day, we savored the gastronomic delights for which Modena is renowned. We learned about Parmigiano-Reggiano cheese and traditional balsamic vinegar production. We also tied on our aprons for the morning and learned how to make some tantalizing (and gluten free) dishes with the help of a renowned local chef at the Osteria Stallo del Pomodoro. 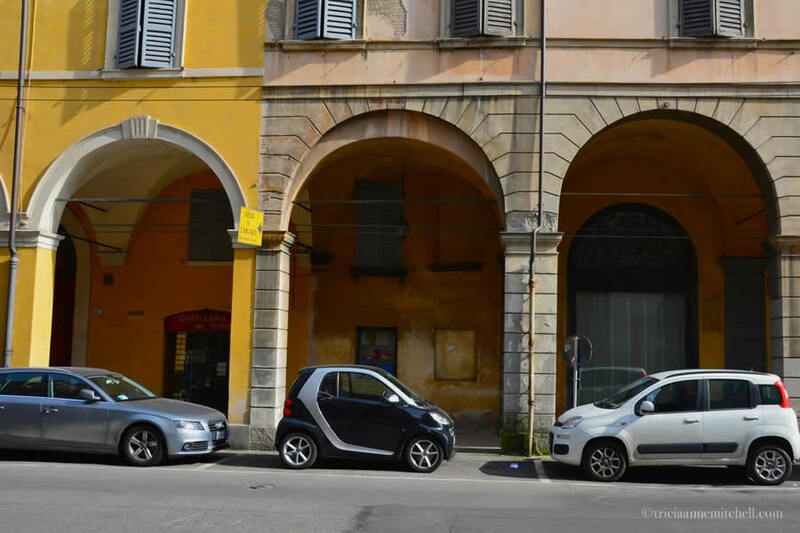 After we’d feasted upon the dishes and savored the region’s delightful Lambrusco wine, we immersed ourselves in Modena’s celebrated car culture, visiting the childhood home of Enzo Ferrari, and spying the meticulously-maintained motors there. 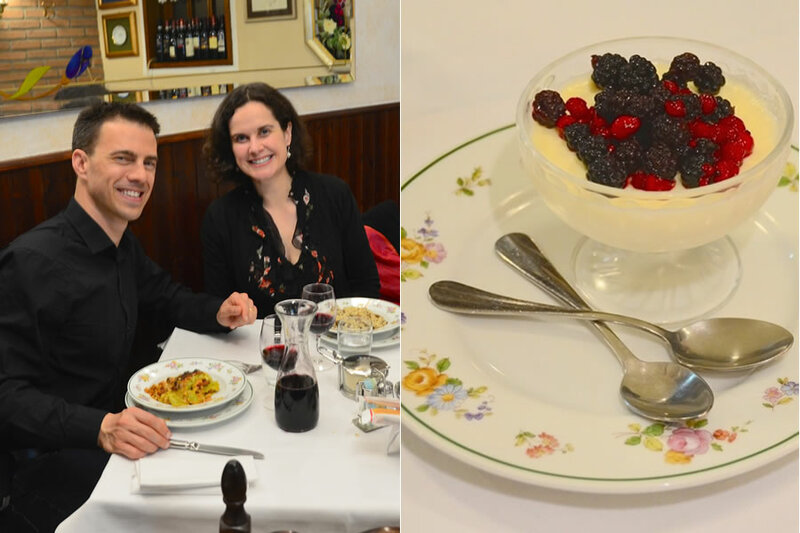 Well on our way to purchasing a larger-sized wardrobe, we indulged in more culinary pleasures at the Ristorante Da Danilo, before returning to our monastery-turned-palace-turned-hotel, the Canalgrande. The next day, we sauntered about the city with no definitive plan. We chanced upon a classic wedding on the city’s Piazza Grande, which brought a tear to my eye; picked up picnic fare at the fantastic covered Albinelli Market; enjoyed Latte Macchiatos at a café teeming with bubbly personalities, admired porticoes adorned with fantastic frescoes, strolled past the city’s theatre honoring its favorite resident, the celebrated opera singer, Pavarotti; explored an open air art market as well as an archaeological park featuring treasures unearthed while building a parking garage, and finished off with three flavors of gelato ice cream. What a great city in which to savor life’s moments! 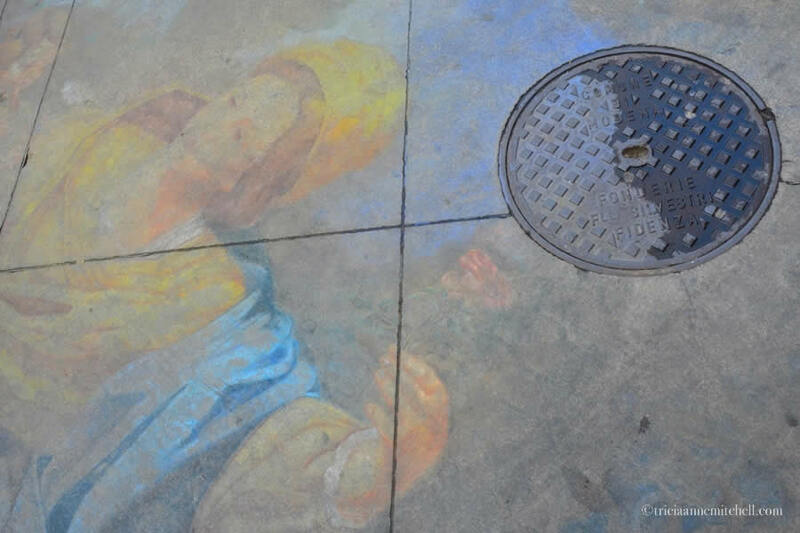 Known as an ‘art city’, Modena’s offerings vary from splendid architecture and museum holdings to brilliant chalk art, such as this sidewalk scene. 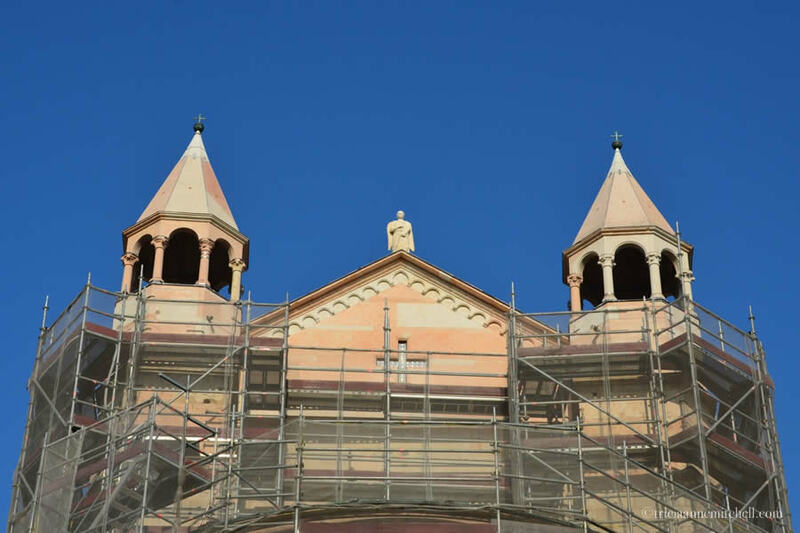 With so many architectural treasures in Europe, it’s inevitable to encounter restoration work, as we discovered at Modena’s celebrated cathedral, the Duomo di Modena. 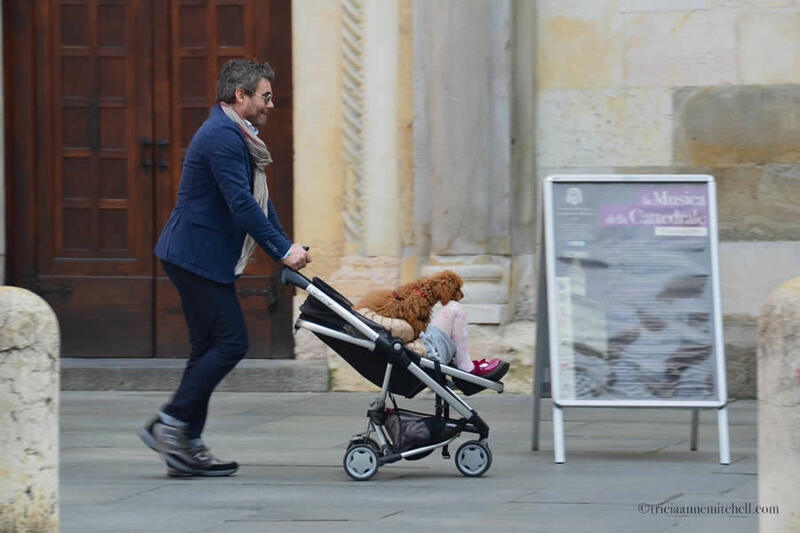 A father whisks his daughter and a canine companion by the Modena cathedral on a lively Saturday morning. 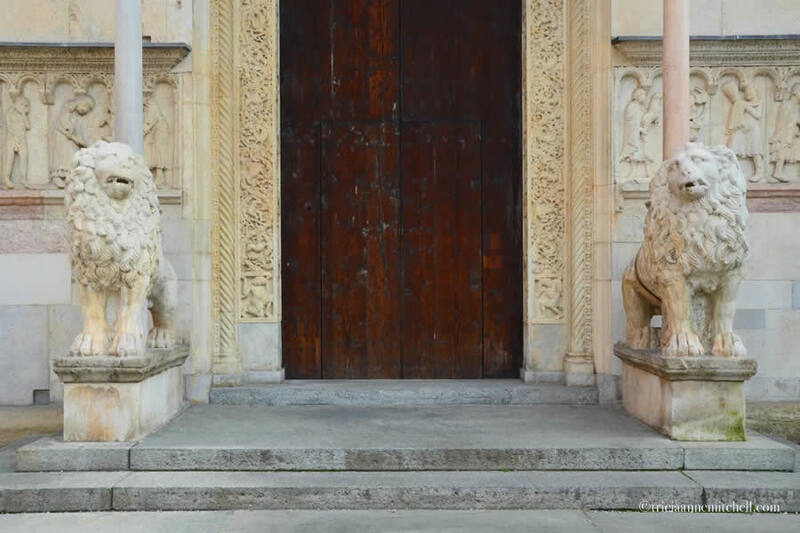 Lions guard an entrance to Modena’s magnificent Romanesque cathedral. The cathedral’s construction began in 1099. 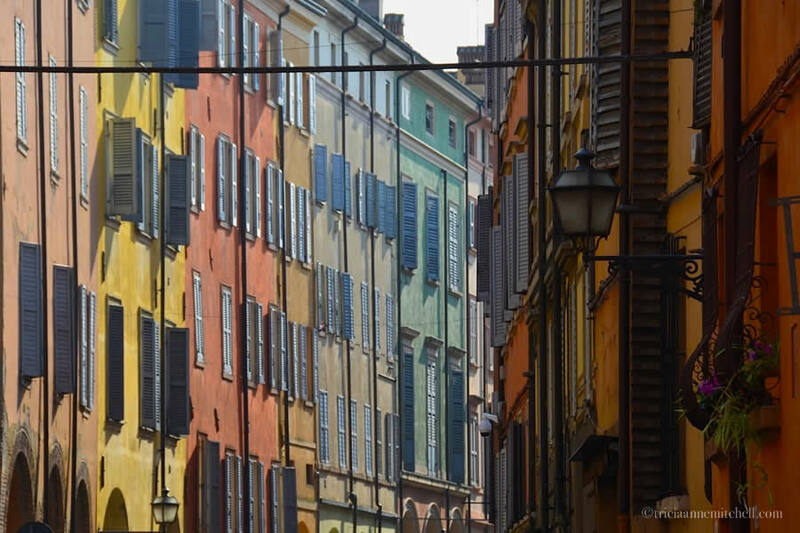 Modena’s symbol, the Ghirlandina Tower, peeks out above earth-toned buildings. Its construction was finished in the early 14th Century, and it was designated a UNESCO World Heritage Site in 1997. Cadets from the Military Academy of Modena, Italy’s West Point, stroll the city’s streets in their timeless uniforms. 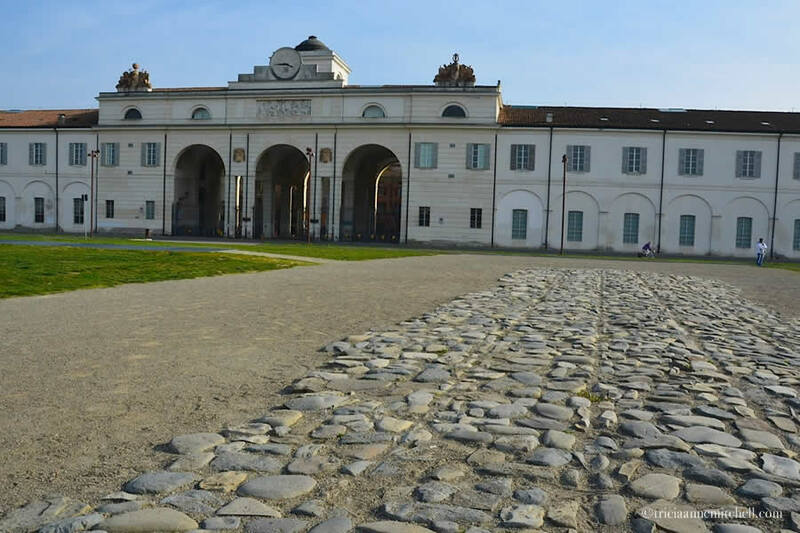 The Palazzo Ducale, where a portion of the Modena Military Academy, or Accademia Militare di Modena, is housed. 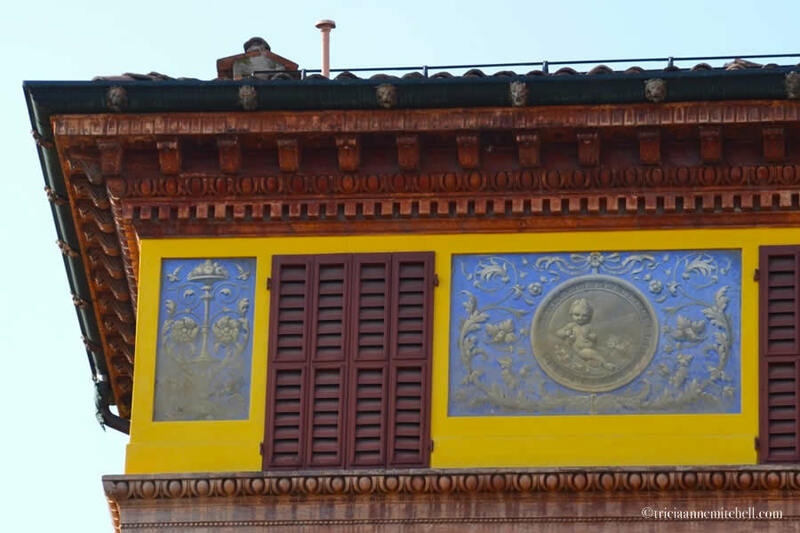 Its construction began in 1634, and housed the Este Court for more than 200 years. 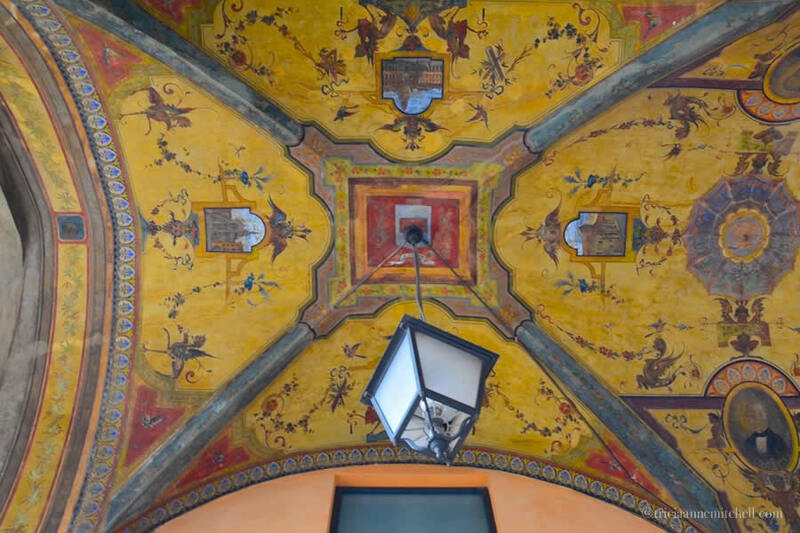 A stunning frescoed ceiling in one of Modena’s innumerable porticoes. 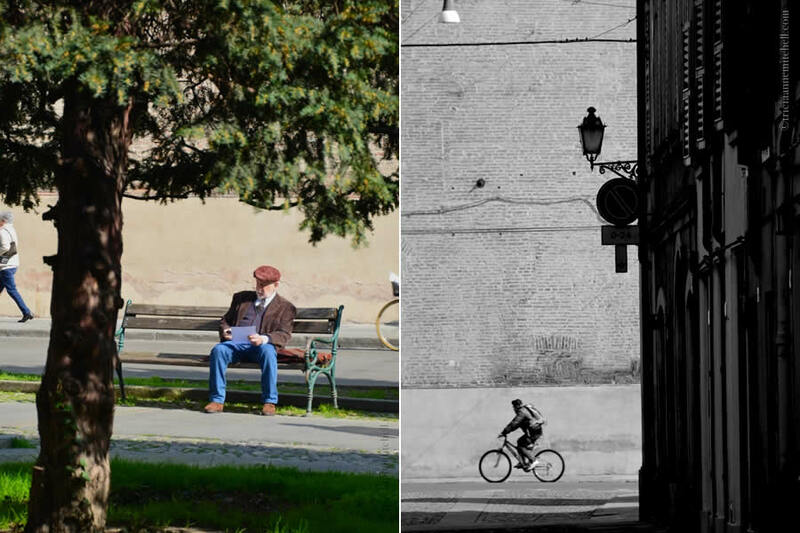 Modena seems to have been tailor-made for unwinding in quiet spots or biking. 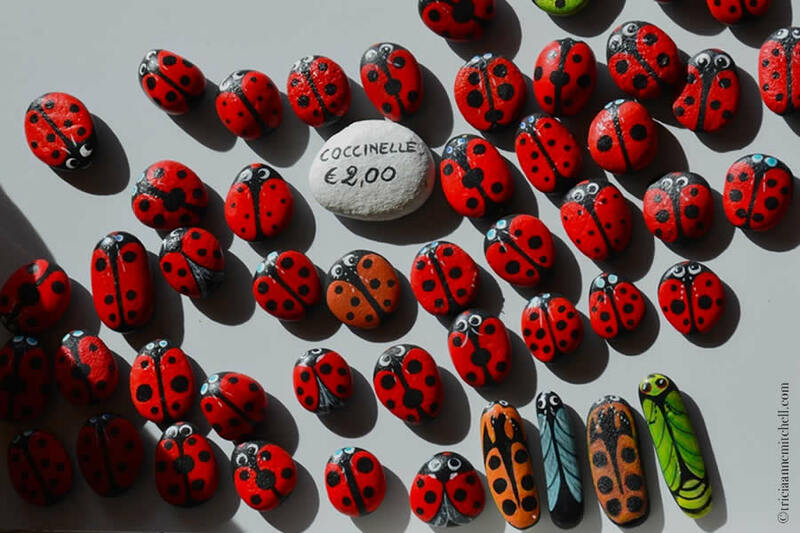 Lady bug magnets for sale at a vibrant, outdoor art market. 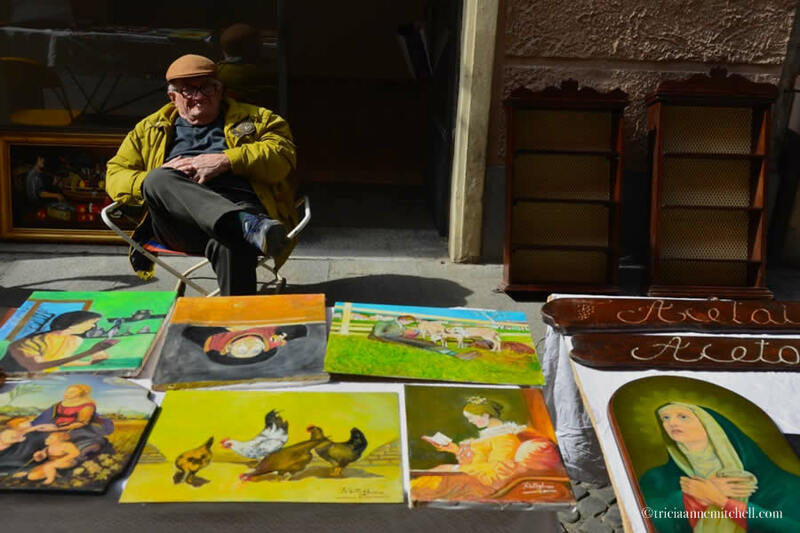 An easygoing art vendor sells his brightly-colored oil paintings. Shawn and I pause for Latte Macchiatos at a café within a well-trafficked portico. Treats to tempt at every turn. Tortelloni stuffed with pumpkin and gnocchi favor prominently on this menu of the day (left). The city’s theater, the Teatro Comunale Luciano Pavarotti. It was opened to the public in the 1840s, and later re-named after the celebrated operatic tenor, Pavarotti, who was born in Modena. 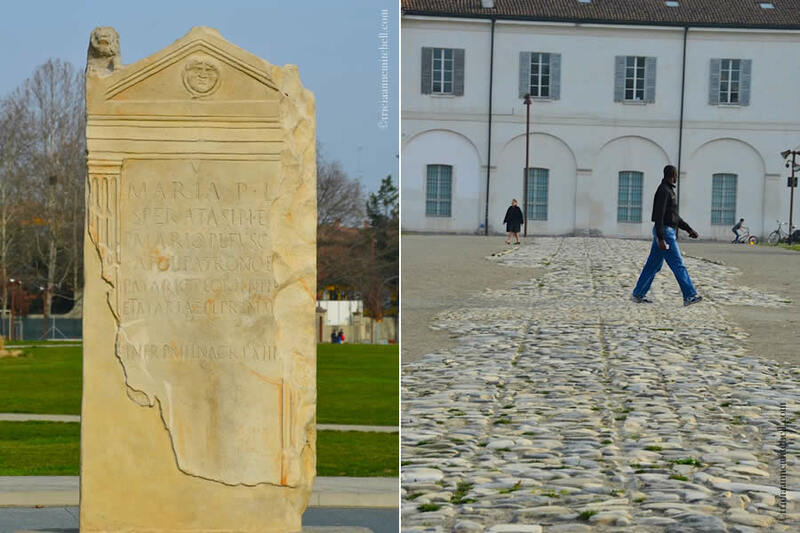 On the outskirts of the Old Town we were surprised to find the Novi Ark Archaeological Park. Presumably when an underground parking garage was being built, Roman-era artifacts were uncovered. The findings date back to the 1st Century BC and 5th Century AD and include headstones, rural buildings, and ancient dumps. This ancient road was found about 5 meters below the surface, so archaeologists meticulously reassembled it at the surface. A Roman-era headstone from the ancient city’s necropolis, and a cobblestone road bearing wagon wheel wear and tear. 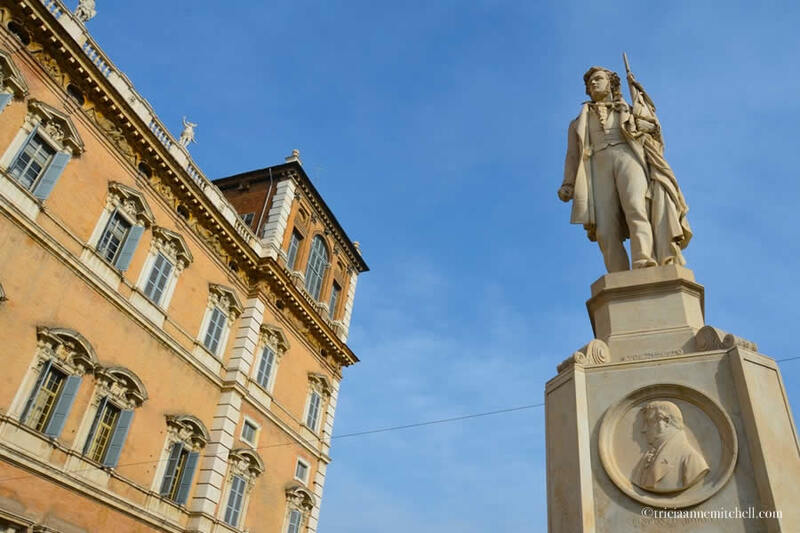 Statue of the Bonissima, which overlooks Modena’s Piazza Grande. 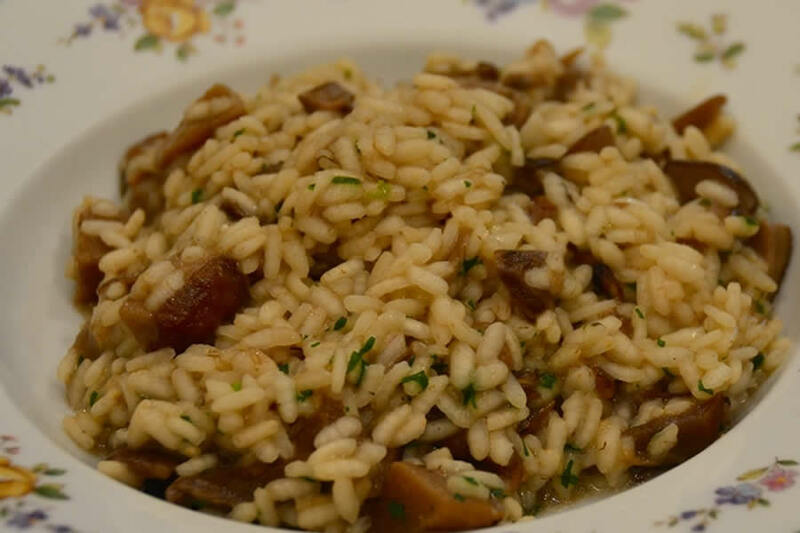 My first course at the Ristorante da Danilo: Risotto con Funghi (Mushroom Risotto, which is naturally gluten free). That was more than enough delicious fare to fill my belly, but next came grilled chicken and eggplant. Shawn enjoyed Lasagna Verde, made with green spinach noodles. Panna Cotta dessert dressed with a tasty blend of berries. 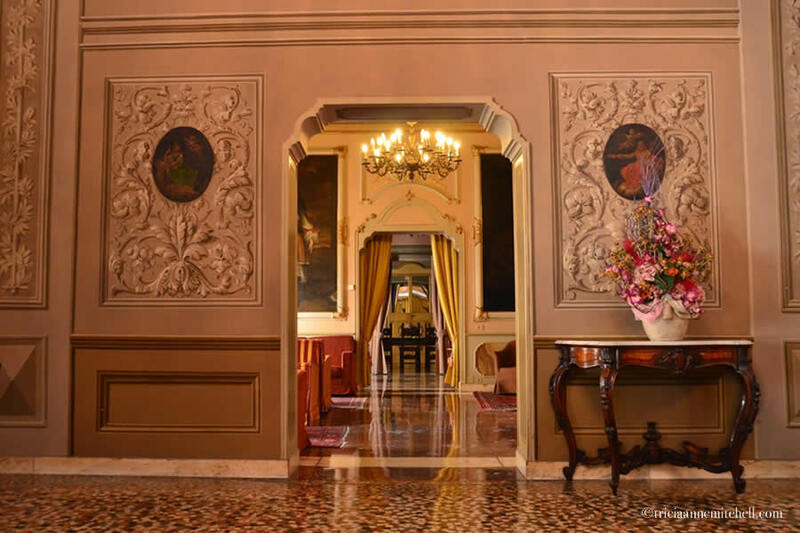 The historic and elegant Canalgrande Hotel, which is situated in a former monastery and palace. Night falls on the Piazza Grande, as pedestrians walk past the illuminated Palazzo Comunale (City Hall). 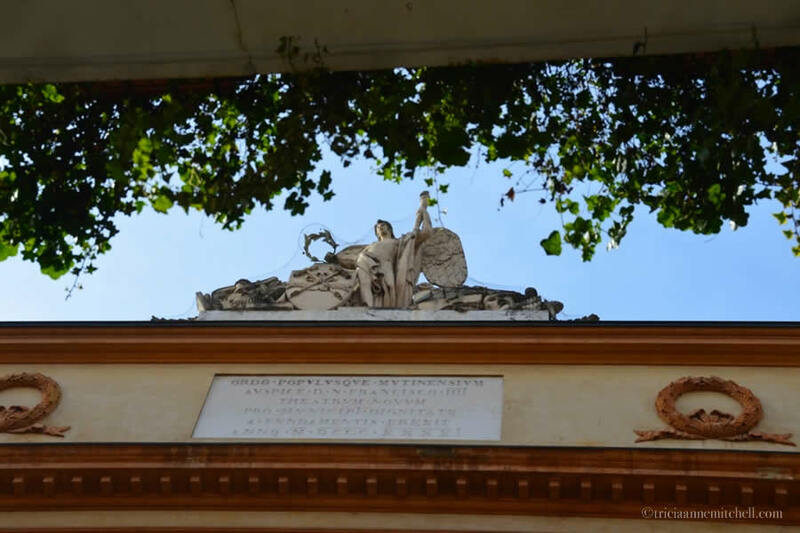 Like the Ghirlandina Tower and Modena Cathedral, the Piazza Grande is listed on UNESCO’s World Heritage List. We picked up our picnic fare from the fantastic Albinelli Market, and dined at Osteria Stallo del Pomodoro and the Ristorante Da Danilo. Our 3 nights were spent at the elegant, historic, and centrally-located Hotel Canalgrande (affiliate link). One of our favorite memories from Modena, in fact, was sitting out on our hotel room balcony just before sunset, looking out over Modena’s rooftops, while enjoying goodies that we’d procured at the Albinelli Market earlier in the day. Cris, grazie mille! Happy to hear that I conveyed my enthusiasm for Emilia-Romagna here. 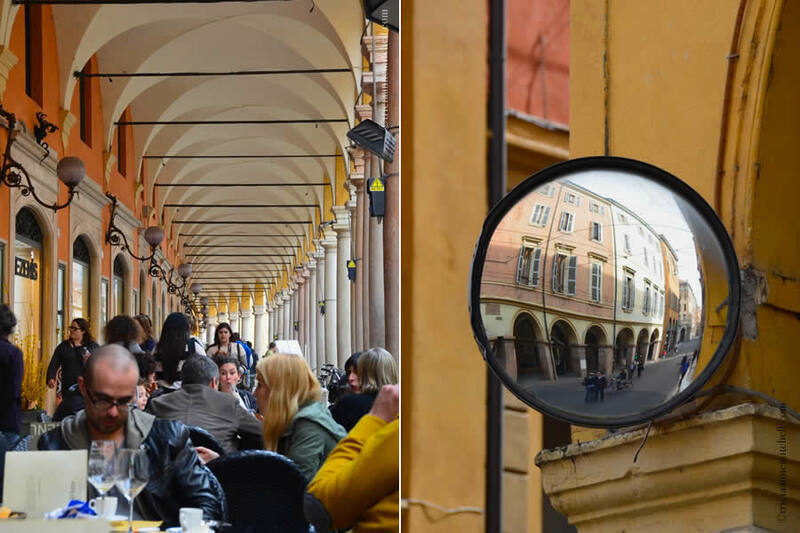 :) From architecture, to archaeology, gastronomy, and people-watching, we found that Modena has it all. 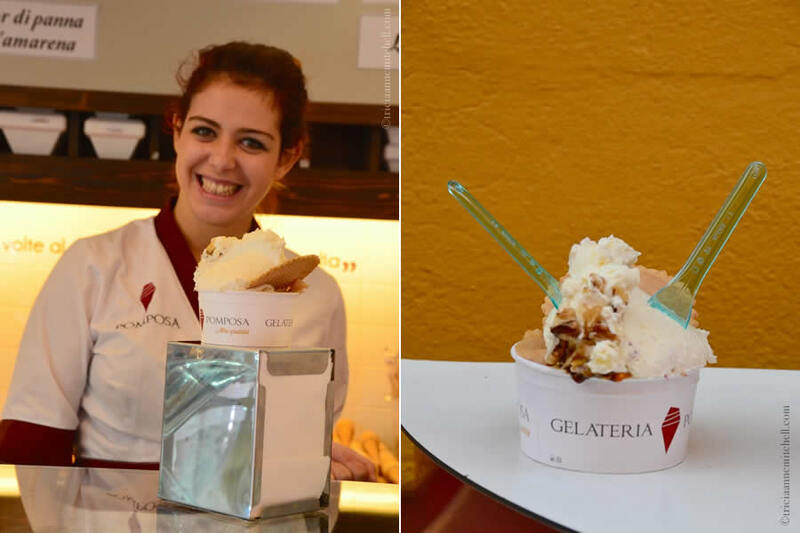 Tricia thank you so much for taking me on a quick trip to Italy……well enjoyed, especially the gelato………with honey, never had that one. Tricia, thank you so much for the express-mail thought, it would have melted at least here in L.A., because we are having another heat wave coming. Heat wave? Lucky you! Oberammergau is having a tricky time escaping a grey veil of clouds – and I think it might approach freezing one of these nights. I sympathize with those who already decorated their yards with their pretty spring blooms. Enjoy the CA sunshine! :) Perhaps one of these days our paths will cross and we can savor gelato together, whether it be in Italy or Germany. I am sure we will, Tricia. How long will you be in Modena? Gorgeous, gorgeous, gorgeous. 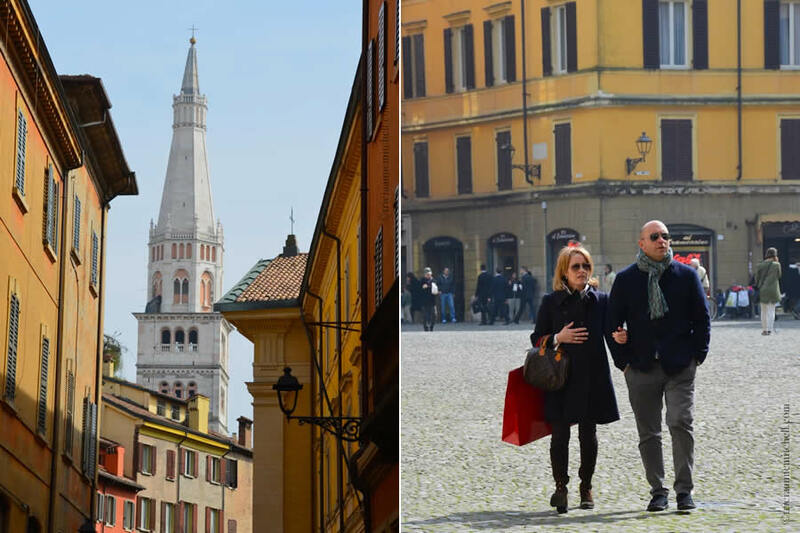 How marvelous to be introduced to Modena – with the luscious food and the intriguing streets scenes. This would be the place to escape to and just enjoy life in Italy. V.
Looks stunning, looks like the ideal place to chill. 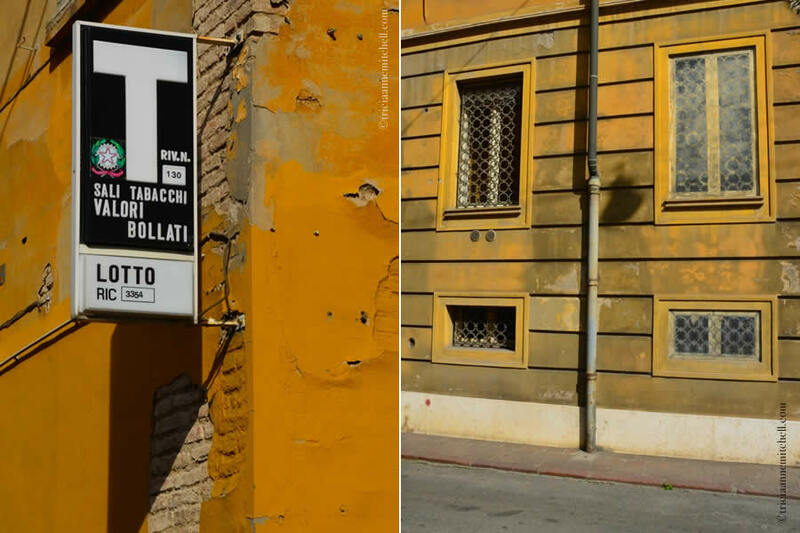 Indeed, Modena seems to have it all. As I type this, I’m missing the food, and the welcoming people. It feels good to be around so many exuding happiness. Lovely photos Tricia. I felt like I was there too. And of course I gravitated to the lovely food. Oh, Carol, the food. 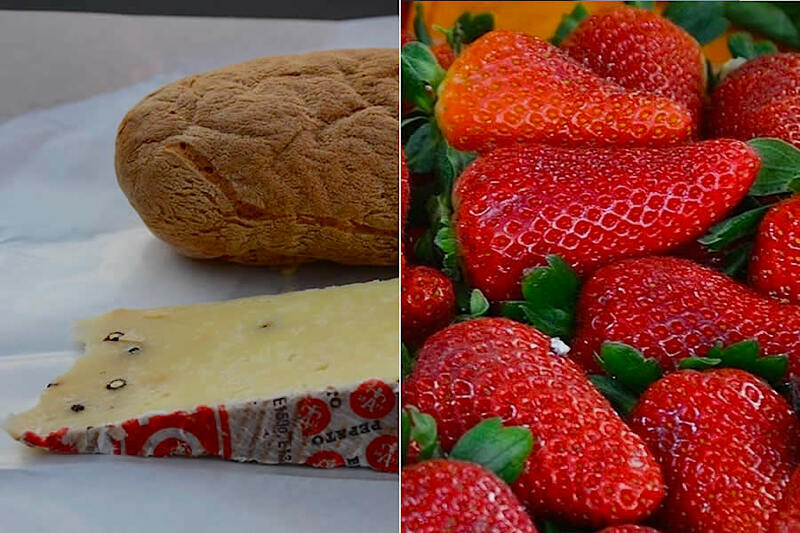 There might have been a healthy dose of fattening ingredients (cheese, butter, chocolate) going into our dishes, but the rich flavor kept our appetites under control, well, sort of. :) When I got home, I couldn’t help but whip up a few look-alike dishes (risotto and eggplant parmigiana). I’m not sure our cooking class instructor would approve, but they helped cure our homesickness for Modena a bit. Tricia. 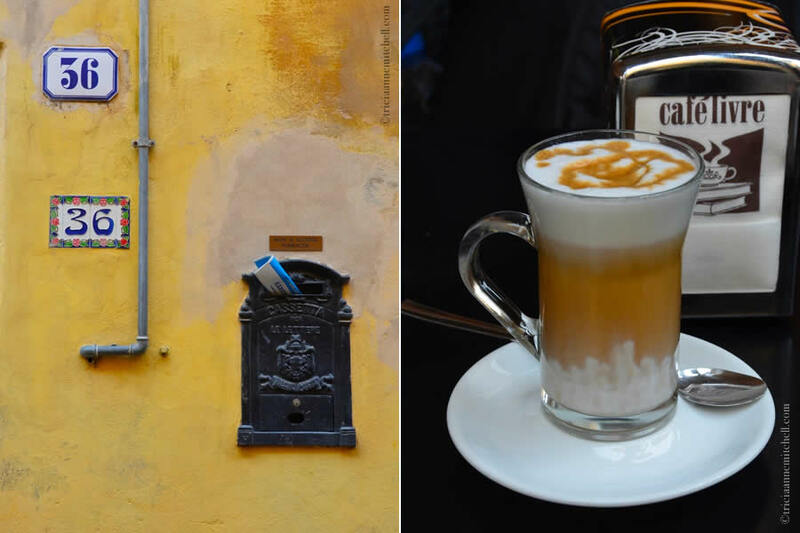 I am savoring each moment in Modena through your attention to detail in words and photos. What a delightful place, Ancient, timeless and with a personality of its own. The attraction is that tourists don’t include this. I know I will, per chance I get to Italy. I believe I will grille eggplant tonight, but the mushroom risotto will have to wait for another evening. You both look so content and happy to be there. Lynne, glad to have had you along virtually for the jaunt. 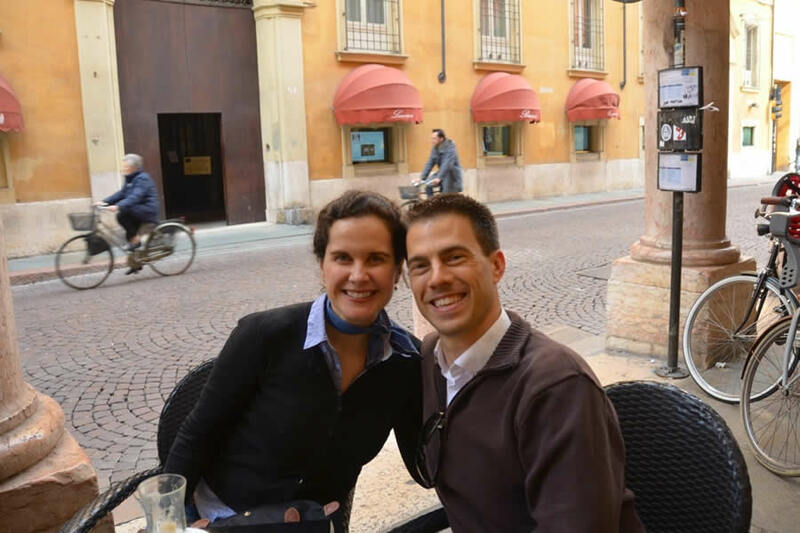 :) As we worked with the videos and photos from Modena, we also noted that we seemed especially happy. I’m not quite sure what the secret was – probably just that so many strangers went out of their way to greet us. I’m sure you noticed that phenomenon in India as well? 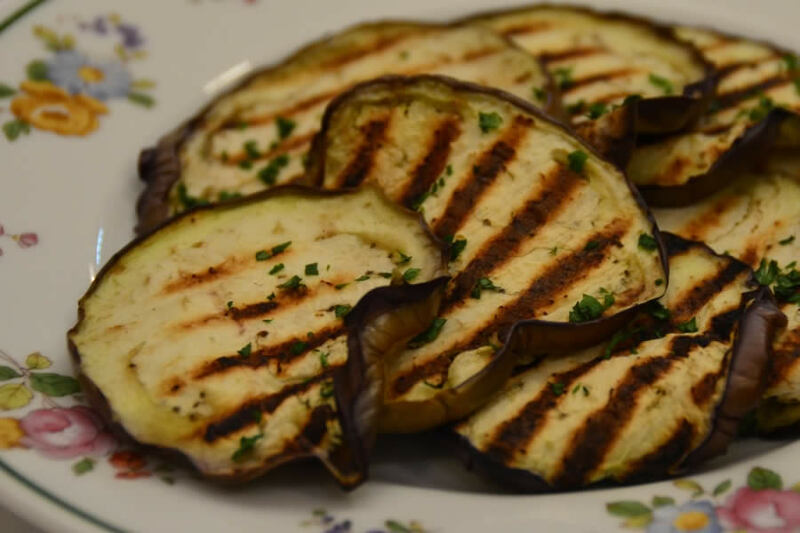 Here’s hoping your grilled eggplant was a resounding success. When we got ‘home’ following our trip to Italy, I also churned out a few rounds of eggplant dishes and risotto. 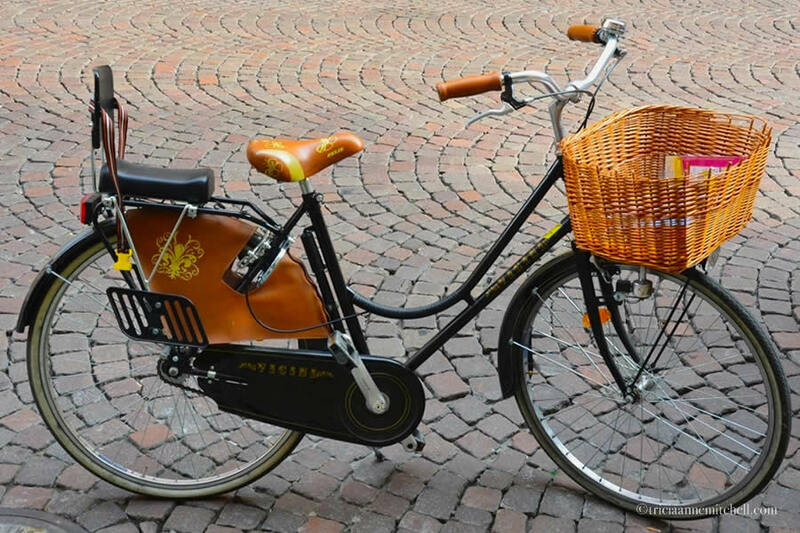 Love the colours — those yellows and rusty oranges. What is it with lions and Italy? There were lots of them staring down on us in Lucca too. Dorothy, the earth tones of the buildings do make for a wonderful backdrop for the foreground colors – vibrant scoops of gelato, eye-catching fashion, and colorful characters. I’m also curious about the symbolism of the lions. It seems I’ve forgotten something from my university art history classes. :-) We encountered a great number of them on Croatia’s churches in the Dalmatia region too (which was once a part of the Republic of Venice). Art history is fascinating!